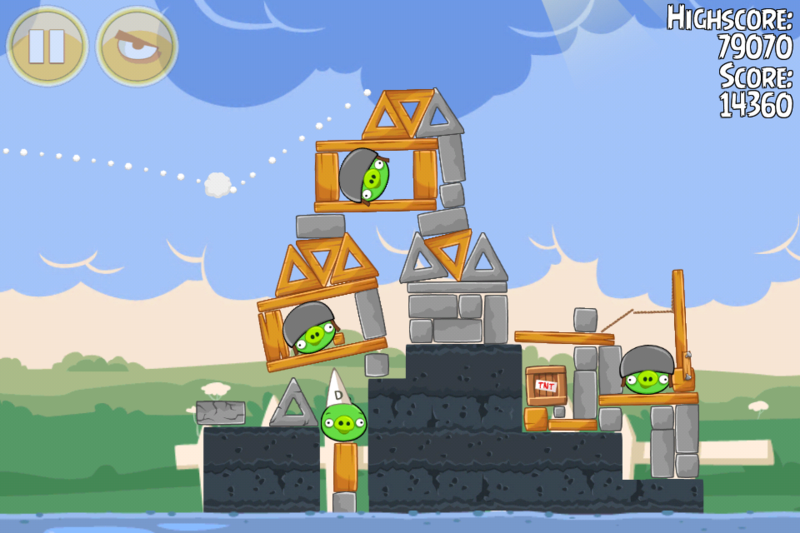 Our strategy for Angry Birds Seasons Back to School level 1-9 is to fire the white bird towards the middle of the left structure. The goal here is to drop the egg bomb at just the right time so as to cause the left side of the tower to collapse, while having the white bird’s corpse fly up and hit the top wood pile, knocking it to the right and severing the rope. When done right the last shot is easy. Just fling the white bird and detonate the egg bomb over the TNT. The score in the video is 71,180, though I was able to get 76 K using this strategy. A one-birder is likely to get you only 2* : ( . Managed to get 1 bird and 3* following video strat — Of course, I already had a higher 3* score and was trying to get above average. : ( I also tried @foley200 ‘s strat below, but wasn’t able to increase my score. If you are just trying for 3*, the video strat may be the way to go. I think you need to get the pig in the dunce cap as well as severing the rope with the first bird. If you’re trying for a high score, foley200’s method may be the way to go, but it’s very hard, at least for me. @sattanen — Any chance you will tell us what method you used? I hoping there is a high score method that is easier for me than Foley’s. Should be I’m hoping, of course. One other thing — Notice the little square wood block to the right of the helmeted pig on the lower left? I think it’s almost impossible to get the pig in the dunce cap unless you destroy this. It seems to be one of those stationary anchors. Anyone else notice this or agree? Finally got above average following video. Enough of this level. I sure hope the average doesn’t go up too much. It’s a tricky mission with very tiny window of error. This is at most a 2-bird deal for 3-star. Got 71400 with 3 birds – just blast everything up. WB doesn’t work that well on i-phone. 82,540 – One Birder – Same strategy as the video, had quite a few goes (the white bird is not a friend). Thought it was going to be another washout but there was a late-ish block onto the “dunce’s hat pig”, the column of stone under the highest triangle was still standing but unsteady, it eventually toppled to the right and took out the 2 pigs on the right hand side as well as the TNT. Done, just struggling with eagle now. You can get 10,000+ more points by doing the first shot then hitting the pile of stones in the center. Un des niveaux les plus durs de la série. Plusieurs jours avant d’avoir le minimum pour les 3 étoiles. I struggled to get above 71k on this level. Then I did a slight variation on the video strat: I dropped the second egg on the right triangle in the middle stone structure instead of directly on the TNT. This will get you an extra couple of thousand points from destroying the stones, and then some stones will fall down and detonate the TNT. I got 87k with a similar strategy. me too, it is a good strategy. good thinking. I looked away from my phone for a few minutes after restarting the level, and when I looked back, the wood at the top had collapsed to the right and racked up about 24k points. Of course, I flubbed the shot with the first bird, and I haven’t gone back to check how common the instability is. It may be helpful in that it would simplify a two-bird finish, but I don’t think that it would assist any super-high scores. Same here. It happend twice for me that the right side collapsed but I couldnt finish the rest with one bird. I’ll keep trying. I agree. The WB is inconsistent on the iPhone. There are times it drops the egg when you tap, but then there have been several instances I’ve tapped only to see the WB continue into a structure without dropping the egg. It’s quite frustrating…. Agree. It seems even more delayed on this level, very frustrating. @kcin76 and others wb same on android for this level, plus some weird delay shaking..kinda of thing happenning..also has any one had the dunce cap explode? Happened to me twice? @kathy: I haven’t had the dunce cap explode, but I also stopped playing this level once I got my current score. I grew frustrated with the wb not dropping the egg when I wanted it to. Luckily I was able to get a decent score, but it took more attempts than it should have. Well I’m back..still not happening..I am gonna pray and whiiinnne for the self collapse..
Nearly one year after your comments were made initially, I’m still having the problem on the iOS version of the White Bird not being as responsive to the tap, and especially on this level (I kept thinking I just had awful reaction time, so I was relieved to hear others had the same issue!). Somehow though, right after reading this, I managed to get 3 stars for the first time, with 1 bird, and I can’t even say how. I was irritated after yet another lack of response from the WB, so I just hit the reset and shot the bird off again w/o paying attention to where, and suddenly all the pigs were gone. Weird. But my point, was that the response is still lagging quite often with the WB! First to drop a millimetre to the left of the small square wooden block and ricochet into the top of the structure. You’ll end up with the main structure tilting to the left something like this. Second high to drop on the right of the right stone triangle, then cross your fingers. Dunce pig can be stubborn. This is the strategy I used, too. As I’m slowly making my way through these levels (and missing my summer vacation from teaching), I’ve been spending quite a bit of time on a lot of these levels. This level, in particular, was a struggle. Still, I can’t believe I’m not even halfway through the levels! I figured out the first shot pretty quickly. Probably the most important thing to add is that the first bird MUST ricochet to the top AND take out the rope/wire. If that doesn’t happen, you can’t hit the spot with the second bird. Second bird exactly as @foley200 describes, “Cross your fingers” is right! It took me quite a while to kill all the pigs with two birds. Yes, that dunce pig is particularly a trouble-maker–probably why it’s wearing the cap! .o just sent another message to slim :) no chance at all can’t even get 3 stars.. I think you may be mistaken here Kathy. Tony uses iPad for one, and I don’t believe I edited this comment at any point — nor do I see why it would have been edited to remove information. Yep,@kathy, @amslimfordy is right. I play on an iPad. I retired my Android phone several months ago, but never used it for Angry Birds. So, I didn’t leave a comment about Android users. Thanks @foley200 for this alternate method. That was almost what I did before but never could place the egg in the right spot because I was not sure what I was doing (of course, that describes me more than I care to admit!). It took a lot of flinging to get the timing and trajectory right, but I finally got both eggs placed perfectly and when the dust settled I had one bonus bird left which increased my score by over 12k! So now it’s time to give my weary fingers a rest. I don’t know, but this level might be a tad easier than it once was. It took me a while, but eventually got a top score. 96440/2 with that for the daily challenge. a good configuration after the 1st is that the tower is leaning to the left a bit and that the carcass of the white has already damaged the horizontal wood above the tnt a bit (occasionally it breaks through and causes the tnt to explode, which is also ok). for the 2nd i was getting better results by dropping the egg more to the top/centre (than to its right corner) of the triangle; the action should then be that one or two stones of the tower fall right, break through and make the tnt explode, whereas the rest collapses to the left (this action seems more likely when the tower is already leaning to the left after the 1st). from what i remember my previous, 92k, best was a 1-birder where not only the carcass set off the tnt, but also the tower collapsed. this time around, i scored first 94k and then 96k, both as described above. based on getting 88k and 89k scores by just setting off the tnt with the 3rd when it refused to explode after the 2nd (with 65k+ scores), i think 98k/99k scores are possible (with 2). @foley200 thanks for this strat. And @vuelva thanks for the tip with the triange. I also think that this level has gotten much easier as it was. @vuelva don’t forget to mention @sweetp in your comment. You deserved this puppy, so get it. I think you are right about higher score two birdies! Perhaps even 100K – 103K. How frustrating! 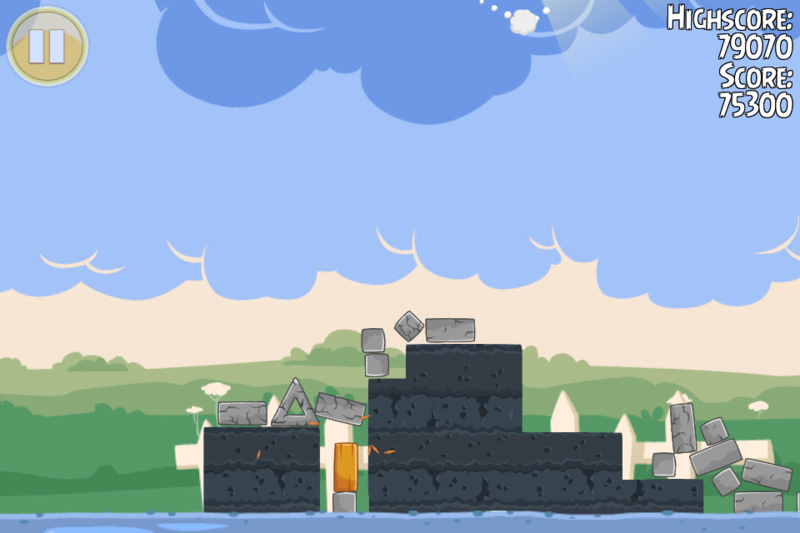 I had 82680 in this screenshot and the stones fell right on top of that left pig! I couldn’t believe it when he didn’t die ;-( waayyy! I would have had 87680 and a 10K left over bird for a final score of 97680 and Top Score! Oh well…I had to send in the third bird and ended this round with a score of 93580 with three birds…That was my best score…but I just got a two birdie for 95310 and enough for a puppy ;-) Congrats to everyone who got one!!! wow, @lesleyg what terrific shooting and terribly bad luck. seeing the potential in your screenshot, did a quick run, as i did yesterday, and could improve twice, first to 97k and then to 98k. not 100k yet, but off to work now. 95130 for the daily challenge. Excellent strategy by @foley200. I found that the best results came when there was some space between the stone triangle and the leaning structure (exactly as in foley’s screenshot). That will give decent odds of the centre stack of stones joining in the destruction after bird #2. Just keep repeating untill you get a score you like. I employed the strategy of @foley200 as well as I could. I truly hate the levels with that stupid white bird that drops eggs. I have a terrible time getting any consistency. OK it’s probably me and not the bird. Anywho…. My first shot as in the picture but not as good destruction. I almost reset because it just did not look very good. Figured I would fling the second anyway. Well the second bird egg hit just at the bottom of the right triangle (you kind kinda see how far right I was in my screenshot). Right side exploded with really good destruction and the tower fell left slowly with the stone pieces falling just perfect to really destroy most of what was remaining on the left. You can sort of see what was still there in the background. I just scored 94,840 points using the first shot/strategy of @foley200 and the second shot as posted by @wicket182 . Thanks to both ! Not the highest score, but enough for another puppy. Congrats to all new puppy owners !! Finally got it with barely an hour to go, thanks to @foley200 ‘s aiming tips and screenshot. 83500 using a slight variation in strategy. First shot same as the video. Second bird low arc detonating at the last minute and using the ricochet to push stones off to the right which then killed the pig, broke the wood, detonated the TNt and pushed the other pig and stones off the platform. I should add that this is a helpful shot if the pig in the dunce hat refuses to die on the first bird. I got 75050 with the same first shot as the video but with an “opposite” outcome, meaning the WB actually popped the right Helmet pig and went through the wood and detonated the tnt taking out right pigs. The left side Helmet pig was also taken out along with the top of structure and it was leaning leftward. Second shot to the now exposed wooden thin plank above the “dunce” pig and remaining top pig. I have read through all the comments on this page and I’m not seeing any mention of any bug. Besides that the White Bird is being a bit hypersensitive, which is true on all devices. I think you were looking for some comments on 1-3 instead? In any case, I do see a lot mentioned on GPlay, so I’m sure Rovio has seen them. Slightly off topic but this level got me thinking. The late drop with white bird seems impossible in this episode, compared with Piglantis where you could almost hit a structure before dropping the egg. So I went back to Piglantis and played some mama bird levels and now late drop is near impossible. (level 1-7 for example where late drop second is vital for a good score). Did Rovio adjust mama bird settings for Piglantis and then revert back for Back To School? And if so, did anyone try playing old seasons level before BTS update to try and exploit this late egg drop? I am glad to hear that the white bird is inconsistent in different episodes. I actually bought a new gaming mouse because I thought it must be my mouse button causing the problem. I do enjoy the features of the G9X Logitech mouse, but it didn’t help with the white bird. White bird is so not my friend! But I shot the first one with an high arc (result is the same as the shot from the video on top) and shot my second bird the same as @f91jsw describes, egg on the stone triangle making the little block fall on to the TNT. I got 78170… will keep on trying, but for now I am moving on. This is how I got the current high score. Managed to knock the middle pile off to the right and Matilda fell in at the end to take out the TNT fort for a bunch more points. This level is harder than it looks, that string across the top right side annuls most attempts to do a 1-Birder, but the possibility is still there.